Over the past few years, The CW has been building a DC Comics superhero universe, with a growing slate of shows that includes Arrow, entering its 5th season, The Flash, returning for Season 3 this fall, and Legends of Tomorrow, which comes back for its 2nd season. 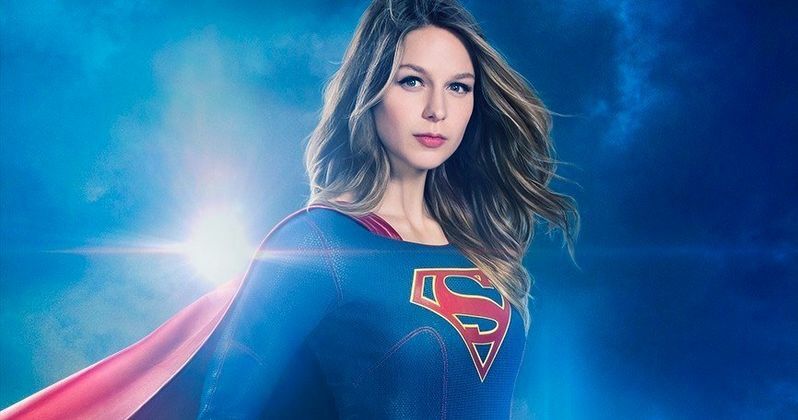 This fall, the network has added Supergirl, which shifts from CBS for its second season, with the Supergirl Season 2 premiere set to air on Monday, October 10. To get fans ready for these all-new episodes, The CW has debuted the first official poster for Supergirl Season 2. Based on the DC character, Supergirl, a.k.a. Kara Zor-El (Melissa Benoist), decides to embrace her superhuman abilities and become the hero who she was always meant to be on The CW series, Supergirl. When she was 12 years old, Kara Zor-El escaped the doomed planet Krypton and was sent to earth where she was protected and raised by her foster parents, Jeremiah (Dean Cain) and Eliza Danvers (Helen Slater) and her foster sister, Alex (Chyler Leigh). Under their supervision, Kara learned to conceal the phenomenal powers she shares with her famous cousin, Superman, in order to keep her identity a secret. Years later, Kara was living a "normal" life in National City, assisting media mogul and fierce taskmaster Cat Grant (Calista Flockhart) and working beside her friend and IT technician Winslow "Winn" Schott (Jeremy L. Jordan) and famous photographer James Olsen (Mehcad Brooks), who Grant hired away from Metropolis's Daily Planet. When Alex's life was threatened in a plane crash, Kara took to the sky to rescue her. In the aftermath, Kara decided she could no longer sit on the sidelines and came out as Supergirl. She now balances her job at CatCo with her work at the Department of Extra-Normal Operations (DEO), a super-secret government agency where Alex also works. At first, the head of the DEO, Hank Henshaw (David Harewood), was resistant to Supergirl joining the DEO, until it was revealed that Hank was actually J'onn J'onzz, the Martian Manhunter, who had promised Jeremiah Danvers on his deathbed that he would protect both Alex and Kara. It has since been discovered that Jeremiah is actually alive and being held by Cadmus, a dangerous quasi-military organization that sees all aliens as threats. In Season One, Supergirl soared fighting crime and battling various villains, chief among them two Kryptonians who were intent on destroying earth, but she has yet to find that same empowerment as Kara Danvers. Now, in The CW's Supergirl Season Two, Kara has left the safety of being Cat Grant's assistant in order to figure out what she really wants to do, while as Supergirl she continues to work at the DEO, protecting the citizens of National City and searching for Jeremiah and Cadmus. Along the way, she will team up with Superman (Tyler Hoechlin) to battle new villains, as she strives to balance her personal life with her life as a superhero. The hit series will be introducing a number of new characters this season, including Lynda Carter, the original Wonder Woman, as the President of the United States. Floriana Lima has also signed on to play Maggie Sawyer, the first ever openly gay comic book character, with the show also introducing her girlfriend Kate Kane (Batwoman), and Barbara Gordon (Oracle), although they haven't been cast yet. While we wait for more details on Supergirl Season 2, take a look at the new poster below.